KATHMANDU, June 17: Nepal Stock Exchange (Nepse) benchmark index shed a marginal 0.9 point this week to close at 1,589.59 points on Thursday -- the last trading day of the week. The bourse remained largely stable this week despite uncertainty looming over the second phase of local level polls. “There is not much excitement in the market. Neither the election nor the budget helped the stocks to rally,” said an investor. “Rising interest rates have encouraged many investors to park their money in banks instead of investing in the bearish stock market. And those who have borrowed by putting shares as collateral are getting margin calls from banks,” he added. The benchmark index, after climbing to a record high last year, is on a downward trend due to rising interest rates amid shortage of lendable funds in the banking system, among other factors. Most of the trading groups ended in the red zone this week. Manufacturing and Processing group posted the highest loss of 41.09 points to close at 2,411.81 points. Insurance group also tumbled 35.86 points to close at 8,377.71 points. The sub-indices of Hotels group also fell 20.39 points to end the week at 2,223.96 points. Development Bank and 'Others' group ended 2.52 points and 2.31 points lower, respectively, at 1,944.42 points and 688.34 points. Hydropower group shed a marginal 0.59 point to end the week at 1,996.04 points. However, Banking sub-index went up by 2.88 points to close at 1,423.29 points. Finance group also went up 0.01 point to end the week at 760.5 points. Trading group remained unchanged at 212.76 points. 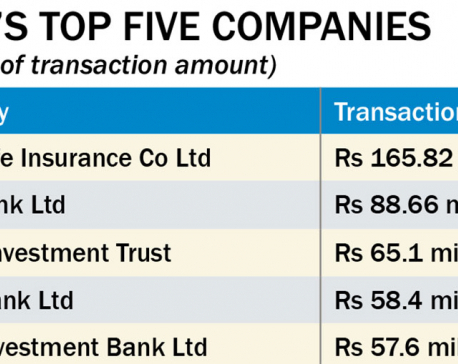 A total of 4.98 million units of shares of 161 companies worth Rs 2.96 billion were traded in the market this week through 30,647 transactions. 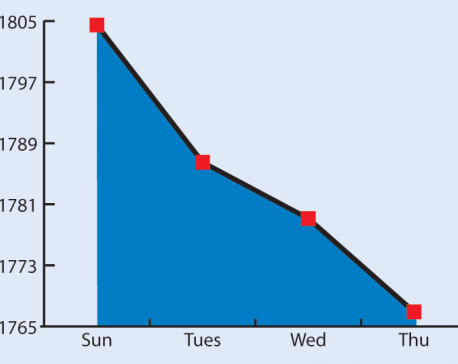 The turnover is 11.59 percent lower compared to last week. 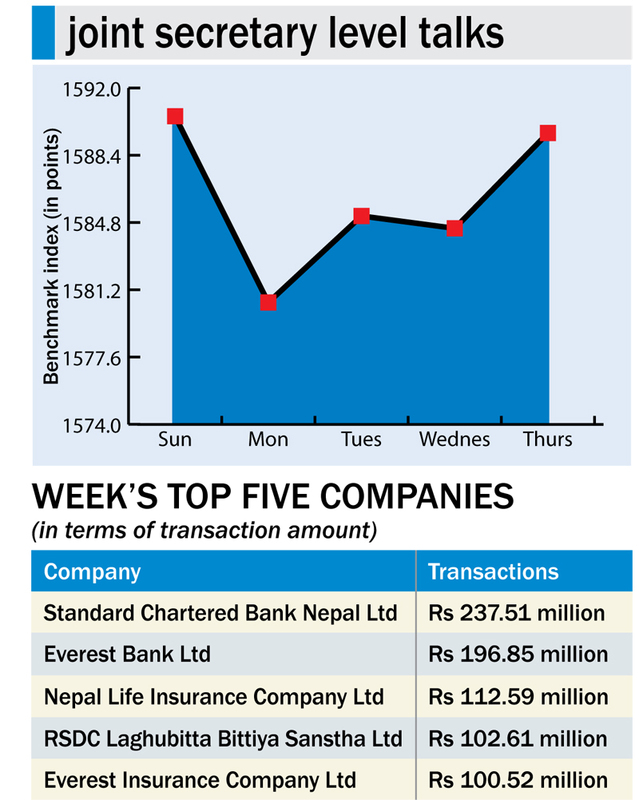 Standard Chartered Bank Nepal Ltd (SCBNL) topped the chart of companies this week in terms of turnover (Rs 237.51 million) and number of transactions (2,802), while Siddhartha Equity Oriented Scheme was at the top in terms of number of shares traded (215,000 units). Bonus shares of Deprosc Laghubitta Bikas Bank Limited, Agricultural Development Bank Ltd, Sagarmatha Finance Company Ltd, Innovative Development Bank Ltd, Century Commercial Bank Ltd, Mount Makalu Development Bank Ltd and Global IME Bank Ltd were listed in Nepse this week for trading. Similarly, rights shares of Sagarmatha Finance Ltd have also been listed in the bourse for trading.